Paul Beedham has been in the family-run Beedham Antiques Ltd in the heart of the Peak District since 1977, where he specialises in English, European, 15th, 16th, 17th century oak furniture. He also sources and sells early sculptural works of art and architectural items in both timber and stone. 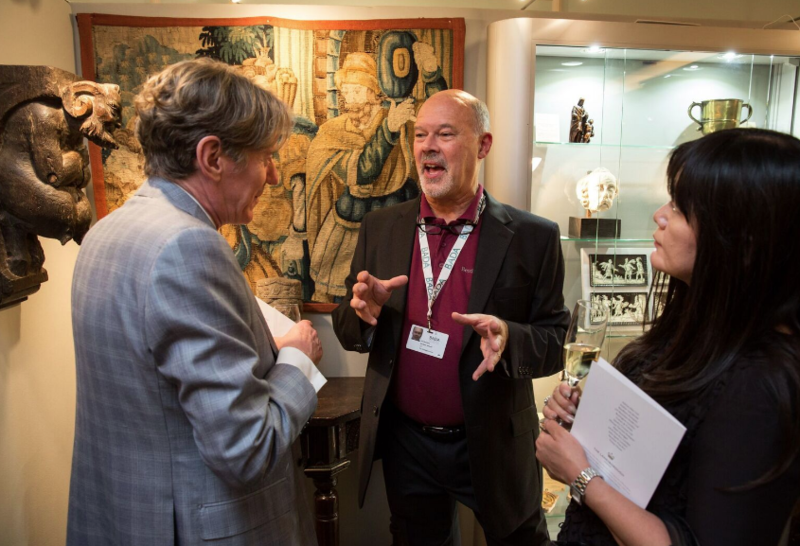 As a BADA member due to exhibit at the forthcoming BADA Fair in March, we asked him about his experience selling antiques and artworks. How many years have you been in the antiques business? Why should people be interested in antiques? They are still a very relevant item to be interested in. Many items are truly individual and not at all commonplace in an era of so much, almost bland, similarity. I am personally a furniture dealer, people still require furniture for not only practical purposes but for aesthetic reasons, too. A great many of our items are able to encapsulate both of those virtues, with added character and individuality. The specialist antiques trade provides the best place to acquire these things, utilising the respective dealers’ years of knowledge and, importantly, their depth of choice. We provide a complete service and offer full aftercare with regards to items we sell, making sure a customer is totally satisfied with their purchases. In the rapidly changing world we live in, it’s very reassuring to be able to offer some traditional value for money, alongside the other traditional values of personalised service that we offer – not something we readily experience via a solely internet-based transaction. What areas/items are currently selling well? In my range of dealing, dining tables, both gateleg and refrectory style; good coffers and chests; and armchairs are very much in demand, along with joined stools. Useful and attractive, small tables are popular. Interesting and quality carvings, both sculptural and decorative, both in wood and stone. What do you think are the current ‘good investment’ items? Well, since we are not investment brokers, that’s a difficult question to answer. I would much rather say pieces of high quality, excellent design with a pedigree of cherished ownership and possible provenance. Since we deal in furniture, colour and surface patination are of paramount importance, they are a must have. Important pieces have always held value very well – ie, made of the highest quality timbers and from the best workshops in their regions, often made for the finer houses of the period. Any good quality, traditional, but totally useable, pieces of furniture – by which I mean practical household furniture. Court cupboards represent excellent value for money today. Elsewhere, chests of drawers, dining tables of either gate-leg or rectangular format; coffers; dressers in any of their formats, with racks or cupboards and drawers or the open serving type. Wardrobes and sets of 17th-century dining chairs are also very good value. Which are the ones to watch? Any of the above mentioned – especially the pieces that can somewhat incorrectly be called furnishing – as they have become undervalued in the last seven to 10 years. What antiques do you collect or have at home? A mixture of 16th & 17th-century oak furniture, some art deco, some 1950’s and 1960’s designer type pieces. I think it’s good to have an eclectic taste, I also believe that the things I specialise in do not always have to be with other Tudor or 16th-17th century pieces to be appreciated or look their best – often looking so much better in different or more modern surroundings with other styles of furnishing. What do you think will be the antiques of the future? Who knows? Maybe the computer consoles and mass-produced electronics of today; so many will be recycled or, heaven forbid, landfilled. Today’s generation may have the nostalgia for what they had before and want to collect it? More seriously, I think anything that is not mass made and mass marketed, that is truly different and quality. Many things today are sold as ‘collectable’ and are thought of as being premier, luxury items. There is an immense industry behind marketing these things that are often anything but ‘unique’, but so many people buy into the hype. How is the industry changing and what will it look like in the future? The business has been changing dramatically, with the inexorable rise of the internet, particularly. Dealers online presences will evolve and continue alongside their traditional outlets. A lot of things in life are cyclical, and I believe there is always room for traditional shops where people still like to come to visit, see, touch and feel the commodities offered. Tell us some trade secrets – what questions should buyers be asking? What antiques/artworks would you buy if money were no object? I love Picasso pottery, Art Glass, a classic Riva speedboat (it’s a work of art in itself), a Lotus Climax Elite (same as the Riva), Helmut Newton and Ansel Adams’ photographs, more early Romanesque and medieval sculpture, more Tudor and Elizabethan furniture, Rennie Mackintosh and Frank Lloyd Wright furniture. You’re down to your last 50 quid – what antiques/art would you buy? A Sheffield Cutlers Stool: it’s simple, ergonomic, three-legged and can stand on any surface. Perfect piece of design, form following function. It reminds me of my father’s first purchases and our businesses beginnings. Where are your favourite antique hunting destinations and why? Any proper antique shops, traditional auction houses, somewhere that all of us like, I guess, where we can have a good rummage around and try to find an item of interest. What are some of the biggest mistakes that buyers make? Thinking they have more knowledge than they really have. Putting wish fulfilment first – wanting to make an item better in your mind than it is in reality. Are antiques attracting younger buyers and, if not, how can the industry reach out to them? Initially it would appear not, however, the business has always evolved to meet new demands with many dealers working to attract new and younger buyers. Whether this is by their exhibitions at shows and fairs, through the internet or social media and in advertising and promotions. I myself present my early furniture and sculptural carvings very differently to how we did 10 years ago. I have a cleaner, semi-minimalist approach using more modern colours. I try to present in a ‘younger’ more modern style to showcase how my items can look in more up-to-date settings. Many visitors to the Fairs I attend, such as the upcoming BADA Fair, are drawn to these early items for their first time. More traditional customers also like the look and still buy for their period homes as well. It is a case of us saying we are here and this is what we do. We are up against the monolithic machinery of global selling and so-called “brands”, so don’t be ubiquitous, be different. Let our brand be that of quality, desirability, individuality – uniquity is antiquity!